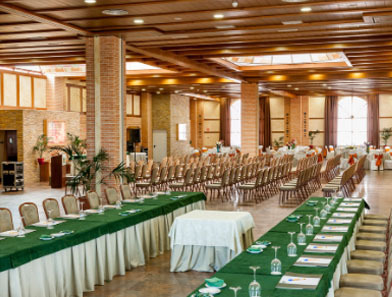 Hotel Comendador puts at your disposal a modern and multifunctional space perfect for celebration of corporate and business events. 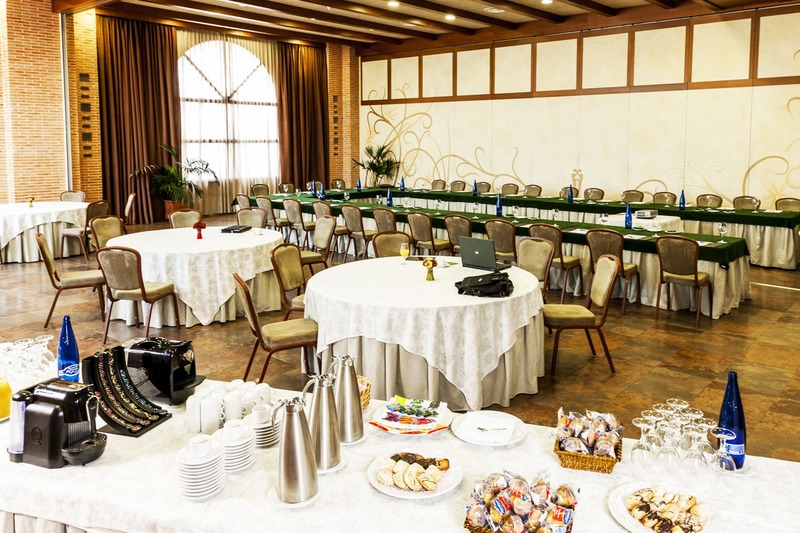 Our venue is carefully prepared with modern and elegant facilities, as well as multi-purpose rooms equipped with Wi-Fi connection, audiovisual and computer equipment. 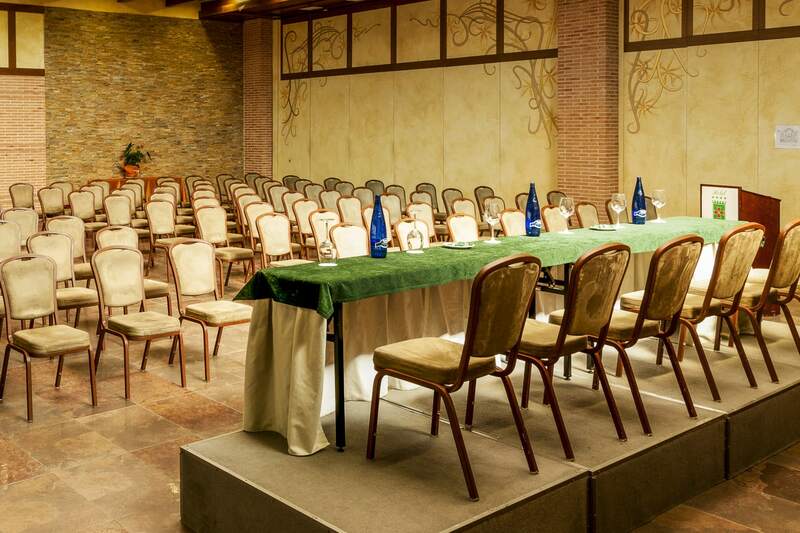 Having a capacity for up to 600 people, our property for corporate sessions supports the celebration of any type of corporate event: business meetings, conventions and seminars, guaranteing the success in the celebration of your conference. 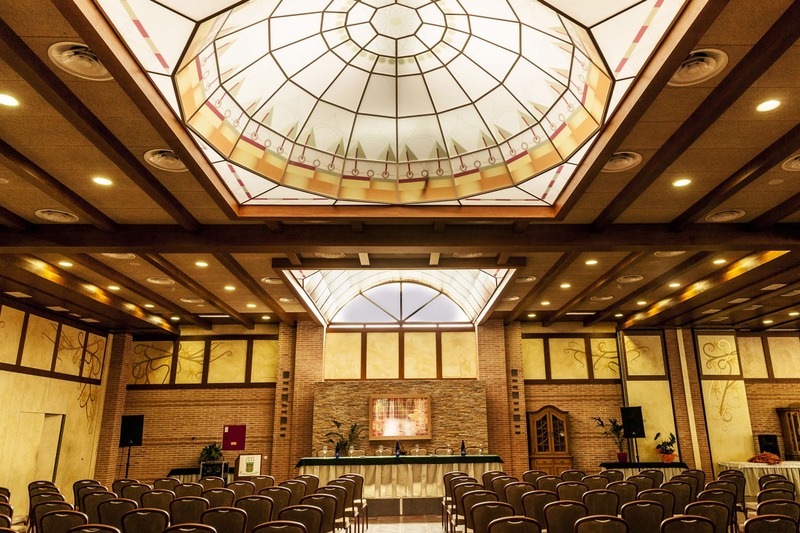 Also, at our establishment for events near Madrid, we offer you a specialized team that will provide you with all the necessary technical and logistical support to ensure that your reunions and celebrations will be remembered as successes. 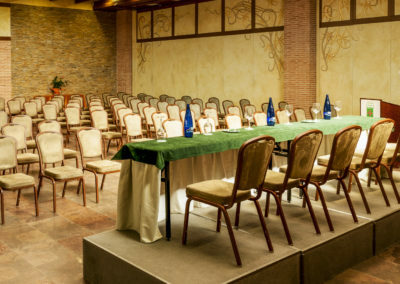 From conventions to congresses, through training sessions, seminars, conferences, boards of directors, product presentations, gala celebrations, auctions or business days. 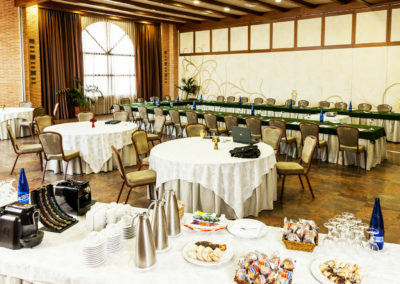 Whatever the character of your event is, we will back you up from very begining to make sure everything goes perfectly. All the celebrations could be accompanied with the exquisite gastronomic offer proposed by our chef, with a careful selection of products and an extensive wine cellar, as well as being able to conclude the day in our nightclub. The perfect brooch for a great evening. We have prepared a varied portfolio of services to help you organize and entertain your sessions, designing them as you like: hostesses, live performances (‘rocieros’ choirs, magicians, singers), clowns, ham cutter, chocolate fountain and floral decoration. 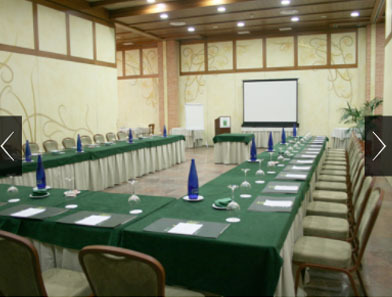 Consult more information about the original events at the Hotel Comendador. 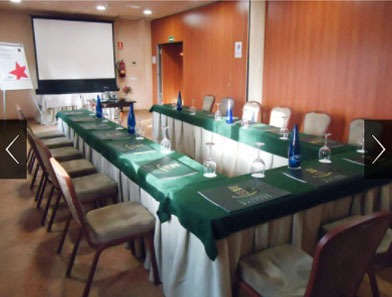 Do not hesitate to contact us if you are interested in holding an meeting near Madrid, we will make your event a success thanks to the quality of our service. 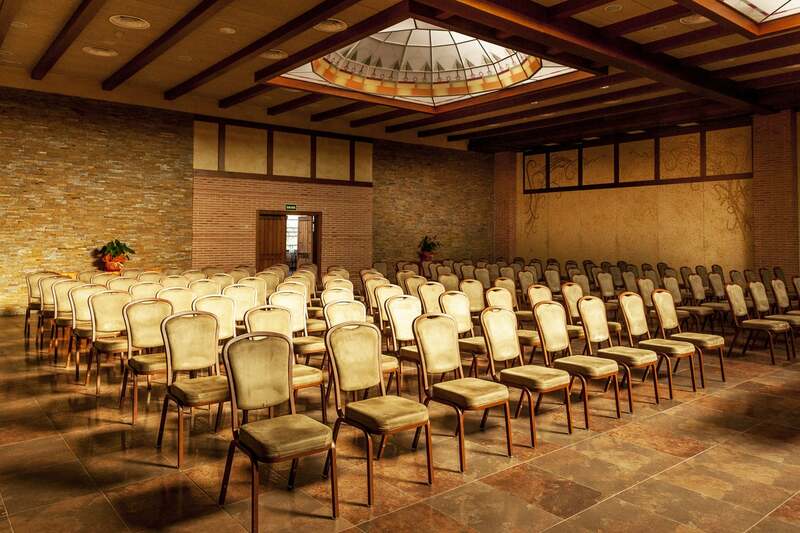 Le presentamos un lugar exclusivo a menos de una hora de Madrid, preparado con modernas y elegantes instalaciones y salones polivalentes perfectamente equipados con conexión Wifi y equipos audiovisuales e informáticos, con capacidad para hasta 600 personas. Asimismo, ponemos a su disposición un equipo especializado que le proporcionará todo el apoyo técnico y logístico necesario para garantizar el éxito de sus eventos y celebraciones desde el primer momento. Desde convenciones a congresos, pasando por jornadas de formación, seminarios, conferencias, juntas directivas, presentaciones de producto, celebraciones de gala, subastas o jornadas comerciales. Cualquiera que sea el carácter de su evento, le respaldaremos desde el minuto uno para asegurarnos de que todo sale perfecto. Todas las celebraciones podrán acompañarse con la exquisita oferta gastronómica que propone nuestro chef, con una cuidada selección de productos y una extensa bodega, además de poder concluir la jornada en nuestra discoteca. El broche perfecto para una estupenda velada. 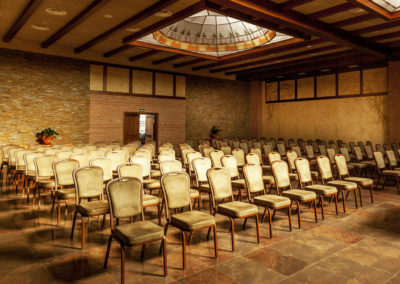 Consulte más información sobre los eventos originales en el Hotel Comendador. 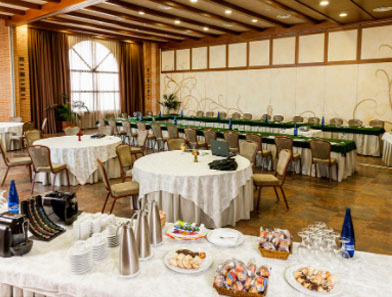 Usually dedicated to breakfast, The Ceres room, is located next to the Baco room. Ideal for breakfast or coffee break, it can also be combined with the Baco room, since the room dividers are mobile. 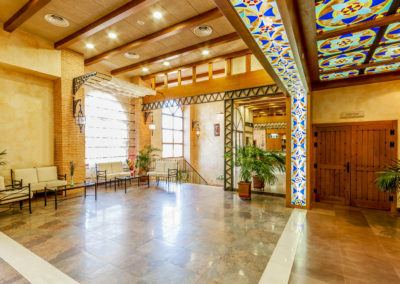 It has natural light and is located on the ground floor of the hotel building and next to the cafeteria..
Usually dedicated to breakfast, The Ceres room, is located next to the Baco room. Ideal for breakfast or coffee break, it can also be combined with the Baco room, since the room dividers are mobile. 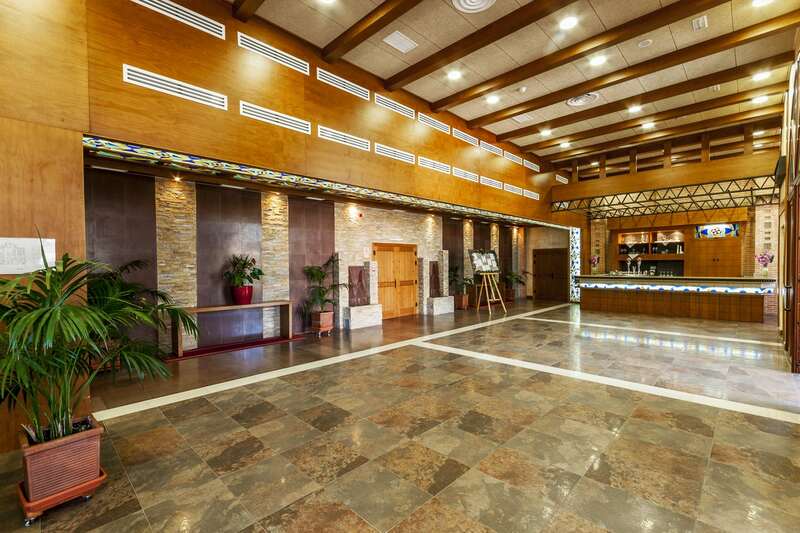 It has natural light and is located on the ground floor of the hotel building and next to the cafeteria. 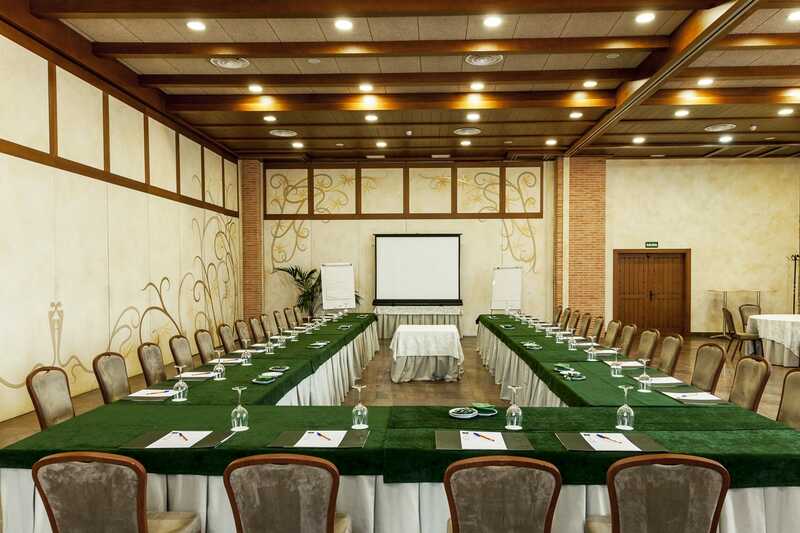 Located on the ground floor of the hotel building, Baco room is ideal for small business meetings or groups.It has windows with good natural lighting. 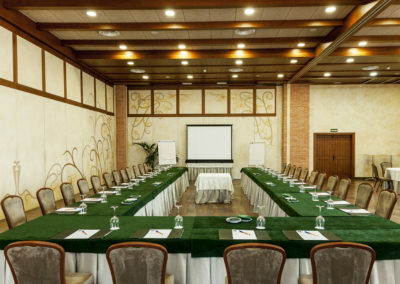 The joint of Ceres and Baco rooms, ideal for meetings with a maximum of 30 or 40 people, has natural light and emergency exit. 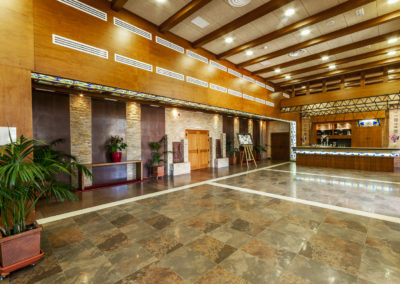 It is located on the ground floor of the hotel building, next to the cafeteria. 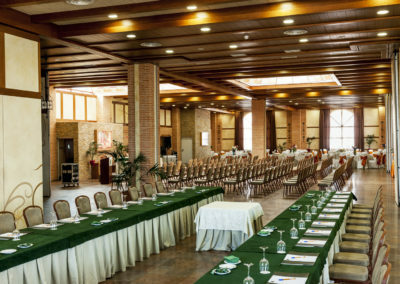 With an identical capacity, Tisbe and Hilas are 2 rooms ideal for corporate conferences which are separated one from each other by the Minerva room, being able to join one of these rooms with the minerva or even combine the three of them, becoming an immense hall for company convention, that Finca Hotel Comendador, makes available to your corporate events. 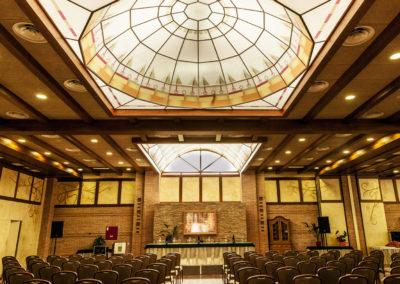 Beautiful Hall, which is part of the Hilas room. Just moving the room dividersit is possible to makle it bigger in order to adapt it to the needs of your company event. 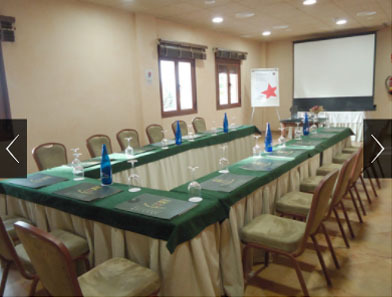 In Finca Hotel Comendador we have a wide range of rooms for corporate events, whether courses, incentives, product presentations, etc. 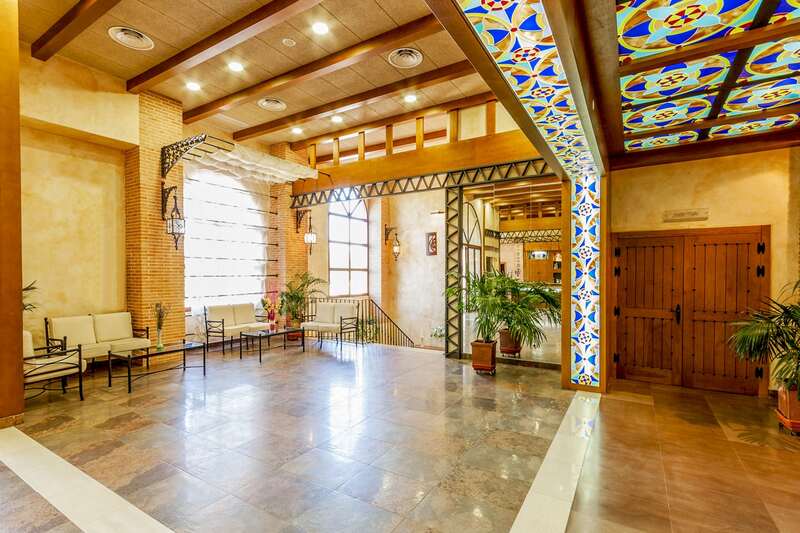 The halls of Finca Hotel Comendador, due to their modulation are ready for any business meetings to be a success, being able to divide or increase space just by moving the partitionable partitions. 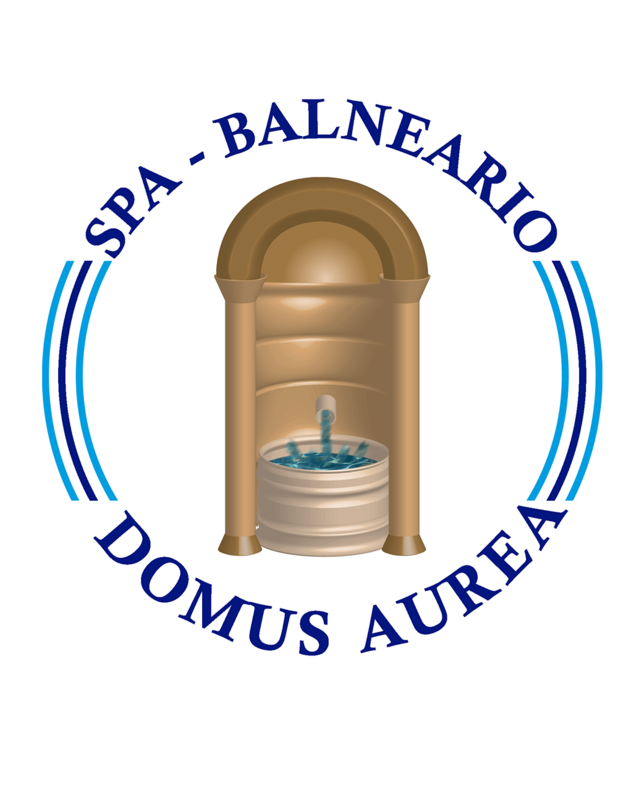 This room is composed by the joint of 2 rooms: the Minerva with the Hilas or Tisbe becoming a huge room with an area of 560m2. 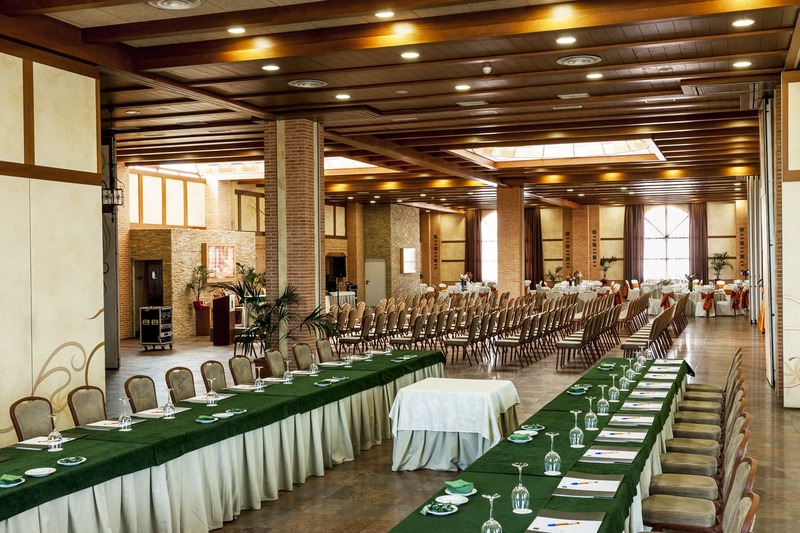 A large open space, with capacity to host large company events. This room consists of the sum of the rooms, Hilas, Minerva and Tisbe, has a total area of 875 m2 and is totally diaphanous. 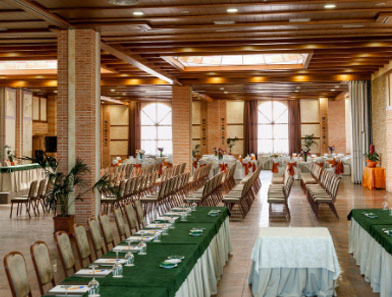 With a great capacity for all types of company conventions. 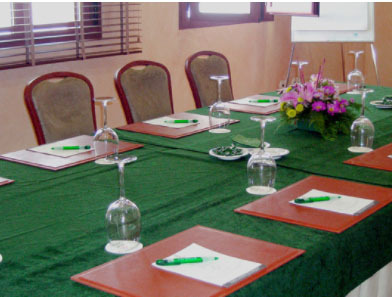 At Finca Hotel Comendador you will find the desired answer for the celebration of your meeting.